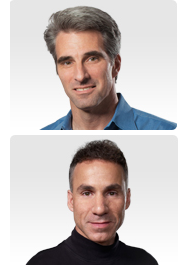 Craig Federighi (top), and Dan Riccio (bottom). Everybody in Cupertino, move up one rung. Apple on Monday announced that two of its influential executives have been promoted and are joining the company’s executive management team. The lucky gentlemen are Craig Federighi, Apple’s vice president of Mac Software Engineering, and Dan Riccio, the vice president of Hardware Engineering. In addition to joining the company’s executive team, both men have been promoted to senior vice president and will now report directly to CEO Tim Cook. Additionally, Apple says that Bob Mansfield—the senior vice president of hardware engineering who announced his retirement in June—will remain on at the company, reporting to Cook and working on “future products.” Mansfield’s new title was not specified. Federighi, who has recently become a fixture at Apple events showcasing Mac software, will still be responsible for all things OS X, as well as Apple’s common operating system engineering teams. He will continue to fill the role vacated by former Mac software chief Bertrand Serlet, who departed last year, but he’ll now have the title to match. Riccio, an Apple veteran who headed up iPad hardware engineering and reported to Mansfield, will now be responsible for all of Apple’s hardware engineering teams for Macs, iPhones, iPads, and iPods. 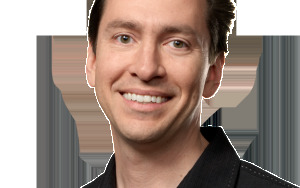 Riccio’s been with the company since 1998, and served as vice president of iPad Hardware Engineering since 2010. This marks the most significant executive team reshuffling of Tim Cook’s tenure thus far, following his January hiring of John Browett to head up the company’s retail operations. Browett has recently been a target of criticism after he made significant changes to the company’s stores, which Apple later said it was reversing. However, Browett was an external hire, as opposed to Federighi and Riccio, who have both been promoted from within their respective divisions. Overall, the major message of the new additions seems to be that Apple is continuing to stay the course. Or, in other words: Meet the new bosses, same as the old bosses.